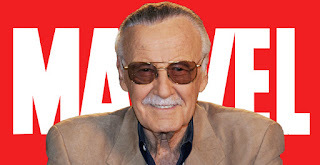 To many who know Stan Lee from the Marvel movies, he may seem like a nice old man who cameos in all the films. I am sure they know he created many of the homestead characters from Marvel, but not only did he help create many characters. Not only was he the Editor-In-Chief of Marvel Comics for many years. He was one of the brains that really had a hand creating the Marvel Universe in print. There aren't many fictional universes as textured and rich as the Marvel Universe. Yes, George Lucas has made one. Yes J.R.R. Tolkein and George R.R. Martin made one. But to be honest, there aren't as many fictional universes on the level that Lee helped create. I don't want to turn this into a DC-bashing article. But there is a reason why I am more of a Marvel boy than I am a DC boy. I definitely like DC and I am huge lover of Batman. But there is something about Marvel that I find very appealing. I've always liked the idea that Marvel felt fairly realistic. When you look at DC heroes and how they got their powers, they feel like larger-than-life, godlike figures. Heck, even Batman, a human feels like a "god" in his own right. And all the fake locations always made me feel like I was reading comic books. The secret weapon for Marvel back in the 1960's and the 1970's was that these adventures were happening outside your window. I always liked that the heroes of Marvel were ordinary people who got caught in extraordinary situations. The characters were more relatable, I thought, which is why I think the movies have been so profitable recently. One thing Stan always hoped and dreamed of was seeing his characters on the big screen. While DC beat Marvel to it, I am happy for Stan that he got to see so many of characters brought to the big screen. Not only that, but Marvel did beat DC in creating a crossover, shared universe on screen and I am so proud that he got to view that. I hope he knows that these characters are going to live on forever, in the best way possible. The nerds won and they rule the world now. It happened without anybody really knowing it did happen. Even back in the 1970's and 1980's, making movies based on superheroes was something most studios tried to avoid, now they are so commonplace that they've been mainstreamed. I went to Chicago Comic-Con back in 2014, and I loved that there were people of all kinds and all different backgrounds there. Superheroes aren't just for nerd culture anymore, they are for pop culture period. Thanks to Stan Lee, I don't think our culture would be there right now if it weren't for his efforts. Lee was more than a guy who did some cameos, he was a weaver of modern culture. And we are all the richer for it.